Spinney Mountain State Park, in south-central Colorado, offers some favorite outdoor activities in a low traffic, secluded setting. Whether you enjoy fishing, boating, hunting or bird watching, the park is well worth the visit. Spinney Mountain State Park is located west of Pikes Peak, south of US-24 where it runs between Colorado Springs and Buena Vista, Colorado. The trip from Colorado Springs takes about an hour and forty-five minutes or if you approach from Buena Vista count on about an hour of travel time. Spinney Mountain Reservoir, with 2,500 surface acres of water, is the park’s main attraction. 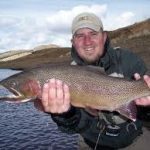 The lake, and the South Platte River on both sides of the lake, offer some of the best fishing in Colorado. The park is internationally known for the size of the fish that can be taken there. Look for trophy size rainbow trout, cutthroat trout and northern pike. Plan to use artificial lures only; bait fishing and snagging are prohibited. The Colorado State Parks Division offers fishing tournaments at the lake; information about the tournaments can be found on the Colorado State Parks calendar. Boating and windsurfing are allowed on the reservoir. Both the north and south shores have a boat ramp and docks for loading and unloading. You must wear a full-body wetsuit for windsurfing. Water-skiing, swimming and wading are prohibited. Most of the park is open to hunting. Geese and ducks, including mallard, bufflehead and teal, can be bagged around the lake. Other game found in the park include rabbits, coyotes, mule deer and, less often, pronghorn antelope. Picnicking is allowed anywhere in the park. Tables and grills are provided on both sides of the lake. The park offers some spectacular views of the Collegiate Range of the Rocky Mountains and finding a picnic site with a view is worth the effort. Hiking trails run along the river both to the north and south of the lake; the experienced hiker can circle the lake on fishing access and game trails. Spinney Mountain Park offers great bird watching opportunities including a chance of seeing three rare species: the bald eagle, white pelican and American peregrine falcon. Although overnight camping is not allowed at Spinney Mountain State Park, there is a private campground near the park entrance. Nearby Eleven Mile State Park also offers camping, so those desiring a longer visit to Spinney Mountain will have no trouble finding a place to stay. Spinney Mountain State Park is open seasonally, closing in the fall when the lake ices over and opening in the spring when the ice melts. On average the park is closed from November 15th to April 15th. At either side of the dam there are small, walk-in only, areas along the river that remain open through the winter for fly-fishing. More information about the park, including maps, updated hours, fees and activities allowed, can be found at http://parks.state.co.us/Parks/SpinneyMountain/Winter/Pages/Spinney%20winter.aspx. The State Parks office for Spinney Mountain Park is located at Eleven Mile but there is a self-serve pass station at the park entrance. Currently it accepts cash and checks only. For more information call the park office at 719-748-3401.